Wether in an exhibition hall or in a hotel: We plan a whole exhibition according to your needs. Of course we consider demands for level-sponsors as well as safety regulations. It will become an important aim to maximize the usable exhibition space. We do the site measurements, manage the deliveries of the exhibitors and send builder and the different trades. 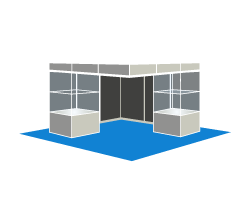 On request we set-up an online-shop for all services so that your exhibitors can order everything in one place. On-site we install a help desk to be available for you as organizer and for the exhibitor. We have a large quantity of construction equipment from Mero and Octanorm in stock to construct single stands and whole exhibitions. In addition we produce digital prints and provide the booths with light, carpet, furniture, plants, screens, computer etc. We operate across Germany and depending on the order volume all over in Europe for highly competitive prices. On behalf of the Deutsche Gesellschaft für Internationale Zusammenarbeit (GIZ ) TEM took over the overall technical management at the 49th Annual Meeting of the Asian Development Bank ( ADB ) . We spent 10 days on site in Frankfurt and have successfully organized the conference . We are pleased that the ADB would like to contract us now for Japan.